Oh lord my urge to buy is increasing. More pics, now with (hopefully) correctly transformed lower legs! After reading this thread, i watched a few video reviews of MP-39 on Youtube, and none of the reviewers transformed the figure's lower legs correctly as per kurdt's advice. 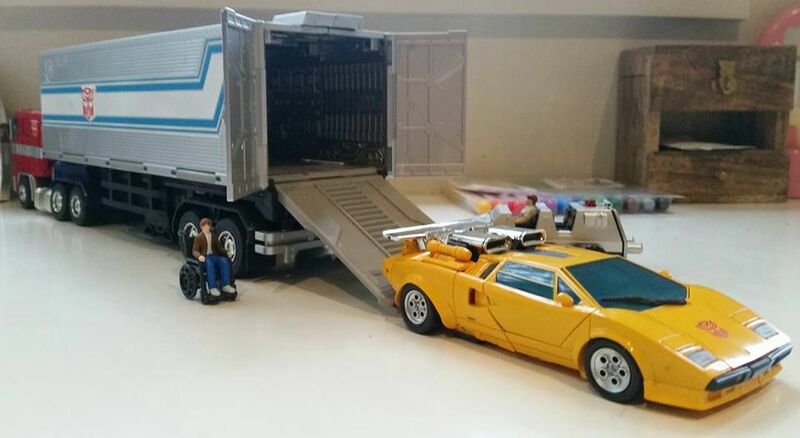 Well, if Hasbro ever decide to release it here, I'll be sure to specify the correct way to transform the lower leg in the English translation of the instructions. But as the Japanese instructions really don't make it clear either in the illustration or the text. The text just says to swing the quarter window section down, but to do it correctly you have to also push it into place so that the hinge sits flush along the calves, and then you need to ensure that the tabs hook under these other tabs to lock into place. The illustrations show it from the rear angle so you can't even see the tabs. It's surprisingly unclear for Takara instructions. Ah well. More piccies! After transforming this toy back and forth a few times, I've managed to get my transforming time down to "only" half an hour! Chip Chase is definitely the same scale as Spike. 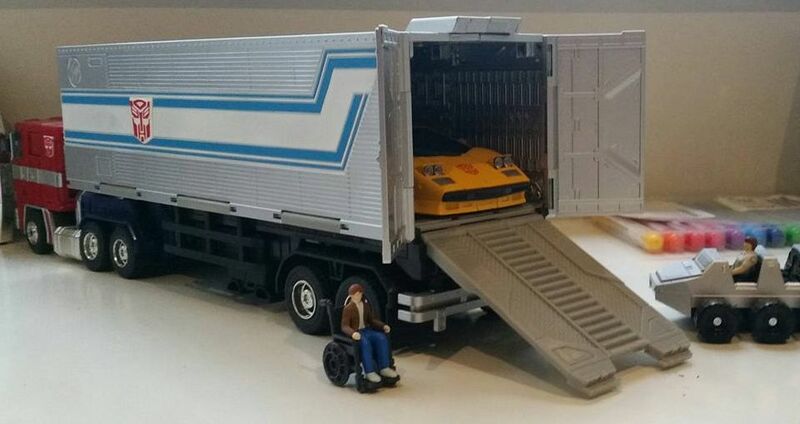 He can also ride in both Optimus Prime's and Ultra Magnus' cabs. Unfortunately Chip can't ride in Roller because his knees stick out a bit too far (and he doesn't have any articulation so you can't adjust the legs to fit in). 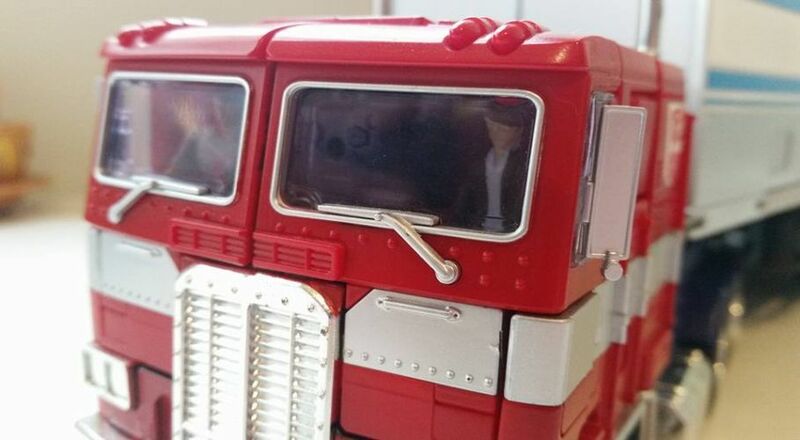 You can see that Chip easily fits in Ultra Magnus' cab. Notice how I lost a lot of sunlight between the second last and last pics? Yeah... half an hour spent transforming Sunstreaker made me lose a lot of light. But hey, if Michael Bay can get away with scenes that jump from day to night then so can I! 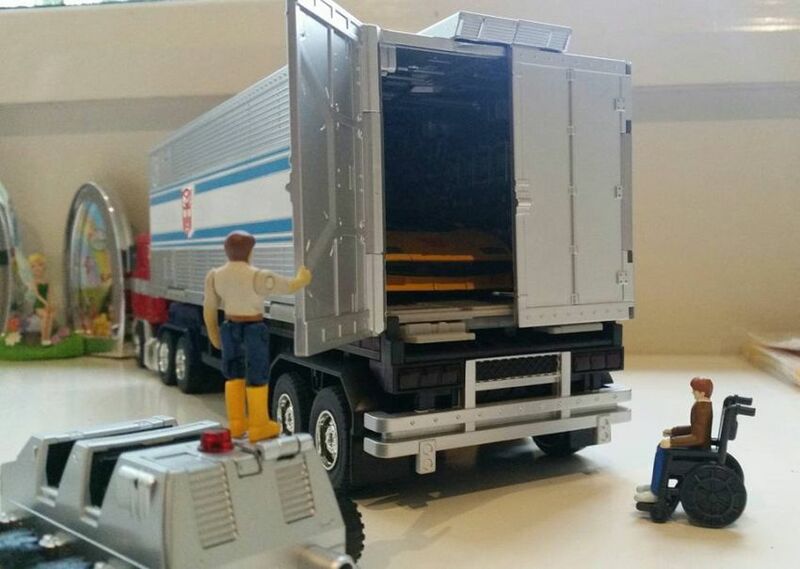 Have almost lost all excitement from Takara but this piece is finally enjoyable. It Rolls! Hell yes out of all the damn cars this one really does what it is suppose to do. 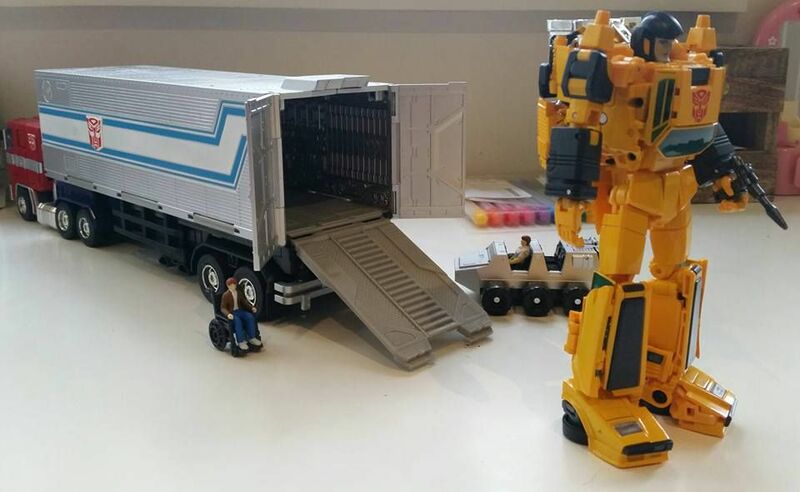 It transforms well, though a lot more complex. 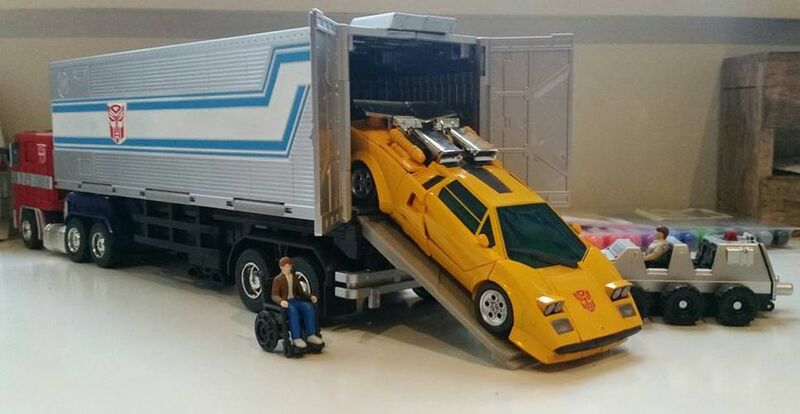 heck I think this is by far the best car bot by Takara. Nick pick? yah the Lambor logo not printed. 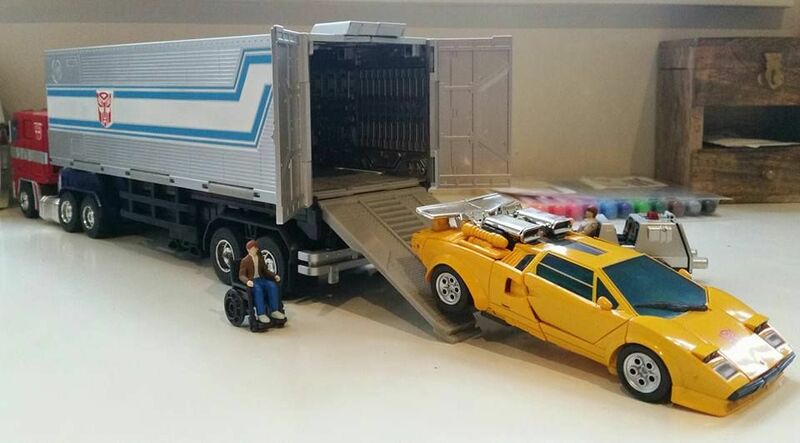 I only say this because even my hotwheels small cars have very detailed prints. They went through all the trouble of not spiting the bonnet but not having the logo seems like a waste. I know I'm going to regret asking this but what MP doesn't roll? Quite a few, Hot rod was a very good example. this piece wont roll due to ground clearance. they dont really roll that well at all. This is my issue, Wheeljack feels unfinished, he could have been a great mp. Soundwave, Frenzy, Rumble, Ravage, Ratbat, Laserbeak, Buzzsaw, Enemy, Stripes, Night Stalker, Star Sabre, Time Warrior, Optimus Primal, Cheetor, Starscream, Thundercracker, Skywarp, Acid Storm, Sunstorm, Dirge, Ramjet, Thrust, Shockwave and Megatron. I mean, they'd roll if you hurled them down the side of a steep hill, but they don't have rolling wheels. Incorrect. All of these these rolling wheels.